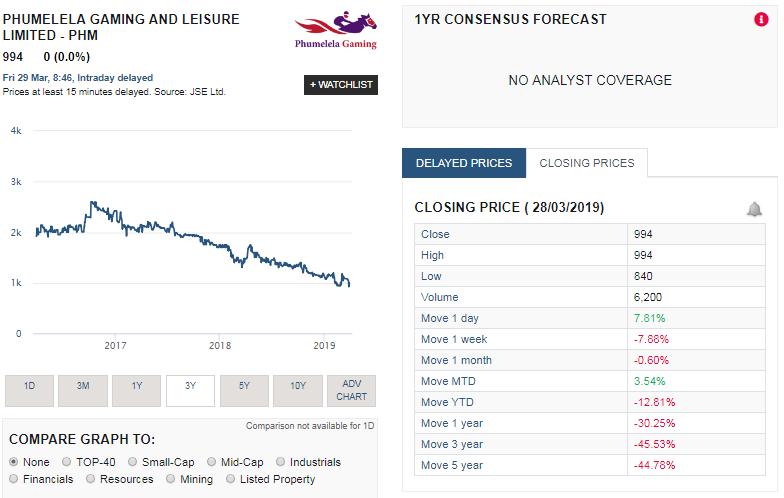 Gaming and leisure group Phumelela gaming released results for the six months ending January 2019. And in the results they mention that the tote's in South Africa has really been struggling. A sign of the times. People dont have money to waste on gambling bets it seems. Below a few of the highlights and low lights from Phumelela's latest financial results. The Group had what is best described as a mixed result for the six months, very good internationally and largely disappointing locally. Consolidated local operations were loss making, equity accounted profits increased, and the Group recorded a 39% reduction in profit before tax. Our international business, driven by Premier Gateway International ("PGI") on the Isle of Man, and the local online betting exchange Interbet, both returned an excellent result. Betting World and Supabets, as did the gaming industry locally and abroad, suffered lower profitability during the period, exacerbated by a difficult December with unusually high sports results favouring customers, in particular on soccer. Encouragingly, our new Supaworld JV is now a profitable reality. The difficulties we faced in the 2018 financial year continued, with political turbulence, labour unrest, criminality, a stagnant economy, low business and consumer confidence, increasing unemployment, higher tax, inflationary administered prices, all a daily fact of business life. The higher rate of VAT in 2018 was a direct cost to our bottom line and the increase too has placed further pressure on already subdued discretionary spending. Horseracing continues to face unpredictability and inconsistency in the regulatory and licensing regime, an unnecessary burden that has financial consequences and inhibits forward planning. Phumelela is a consumer-facing business with a large retail footprint and is directly affected locally by these negative macro factors. Our partnerships with Supabets and Interbet are important. We are developing a healthy and productive relationship between our wholly owned fixed odds business Betting World and Supabets, from which the complementary Supaworld JV was born and which contributes a 75% share of earnings to Phumelela. The TAB and Betting World websites will operate on software developed by Interbet, our joint venture online bookmaking business and betting exchange which has proven to be an excellent investment. Phumelela, Kenilworth Racing, and Gold Circle stage race meetings 364 days a year with live media and data rights, produced by Tellytrack, sold locally and to an expanding number of overseas territories. Without a successful domestic sport there isn't a successful international presence. Management is engaging with key stakeholders in the horseracing industry and in gaming to improve relationships and mend fences where there has been discord. The Board remains open to any realistic and constructive ideas that may benefit horseracing and the shareholders of Phumelela. Even as we strive to develop, management has taken a view that in the likely absence of a meaningful improvement in the domestic economy, we have no option but to right size the Group because of these commercial realities. Further to the voluntary severance programme in the previous year, we have identified additional areas where we are not fit for purpose and where we need to right size. Detailed action plans, costed and modelled for their beneficial financial impact, are being implemented. All executives have cost reduction targets, there are no exceptions, and they are tasked with delivery thereon. This has been a difficult six months, with more than its fair share of challenges, a reduced level of profitability, and limited balance sheet flexibility. Nevertheless, the Group is resolute in pursuing its strategic objectives, which include being the standard bearer for the sport of thoroughbred South African horseracing and offering punters an exciting gaming experience through the complementary brands TAB, Betting World, Supabets and Interbet. The screenshot below taken from Sharenet shows PHM's share price performance over the last 3 years (the graphic) as well as the share price performance over various time periods. With tough economic conditions in South Africa, and money being tight, we cannot see PHM reverse their fortunes in South Africa any time soon. Investors in the company should be relieved about the fact that they do at least have operations outside of South Africa.